Instead, I am going to post a picture that makes me happy. I don't know why. This painting is called "Flaming June" and even the name makes me feel light-hearted. June...I feel like she could be my friend. The color of her gown is vibrant and liquid...almost juicy. I can feel the gossamer folds, running like water between her thighs. The ocean breeze caresses her, and I can smell the the scent of her hair as it warms in the sun. I think it smells like jonquils and baking bread. She is relaxed, serene. I wonder if it is the sun that has warmed her, or a lovers touch. I wonder if its the exhaustion of ardor that tranquilizes her. I am brimming with contemporary disquiet....I long for her contenment and langour. Sometimes I think that if I lie as still as she, and imagine the tang of salt on my lips...I can steal it away for just a moment. Its a thought that cheers me. I find solace in her. Perhaps you can too. 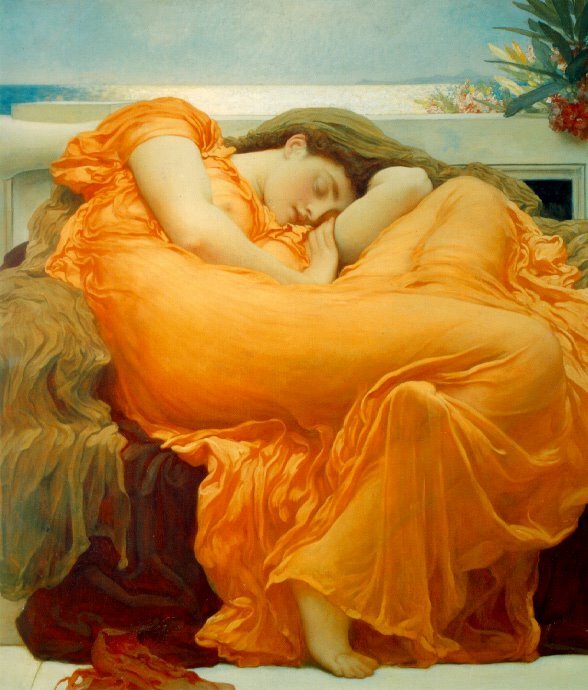 Lord Leighton would be pleased, I think. That picture makes me yearn for a sleepy spring afternoon. Weary from a morning of gardening and freshly showered. I saw that painting and I imagined myself exactly like that... relaxing, having a wonderful siesta on a Sunday afternoon. Nice inspiration, to be sure.